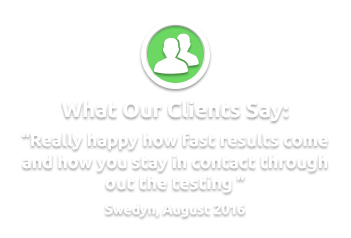 Fast & Reliable DNA Testing- Only $309- ISO accredited lab. homeDNAdirect is your local provider of DNA testing services operating from our office in Auckland. We offer a wide range of paternity tests and relationship testing services as well as clinical, health and prenatal tests. Our DNA tests are carried by an internationally accredited laboratory that has conducted in excess of 300,000 tests worldwide for your peace of mind and assurance. We offer a cheap, accredited, comprehensive genetic marker DNA paternity test for one alleged father and child for the one-off price of only NZ$ 309 – with results available in just 5-7 working days. This fee includes the kit for sample collection, the analysis and a fully comprehensive report. There are NO EXTRA FEES. Once your order has been placed your DNA testing kit will be sent promptly from our Auckland office. We offer our services all over New Zealand including the cities of Wellington, Christchurch and Hamilton. Our home testing kit is extremely quick and pain free. Sample collection is done using simple mouth swabs enabling you to easily collect DNA samples in the comfort of your own home. homeDNAdirect is New Zealand’s leading provider of accurate, reliable and affordable DNA tests. Our vast portfolio includes a wide range of tests such as DNA relationship testing; here we have a variety of tests that can be used to establish whether relatives are biologically related. For example, aunts and/or uncles may be interested in knowing if they really are the biological relatives of their nieces or nephews or siblings may wish to confirm if they share the same biological father. Aunt/uncles tests, siblings tests and grandparentage testing are just some of the relationship tests we offer. Our infidelity DNA services are ideal for clients who suspect cheating in a relationship and have gotten hold of a sample which they believe to contain human biological material. homeDNAdirect New Zealand also offers a range of DNA ancestry testing services, including maternal and paternal lineage testing as well as ancestral origins testing. Our relationship tests and paternity tests are performed to the strictest quality control guidelines and our DNA testing laboratory is accredited with ISO17025. The lab is equipped with the latest state of the art equipment and has a team of scientist that is highly trained and experienced. We carry out most of our tests with sterile, oral mouth swabs. However, our forensic DNA testing services mean we also accept discreet samples such as hair, cigarettes, blood and toothbrushes amongst others. These samples can be used as alternative DNA sources for your test and are ideal in cases where it is not possible to collect mouth swab samples from a test participant. If you require additional information about any of our DNA tests or paternity testing services we suggest you contact us to discuss your case in more detail and advise you accordingly.